Location! Location! Location! This light & bright single-family view home offers a multitude of hard to find attractive features! 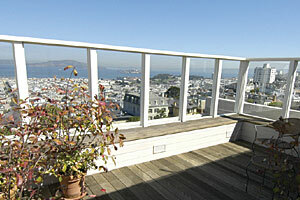 Rare Bay views north and verdant Alta Plaza Park views south with a view roof deck to enjoy it all. 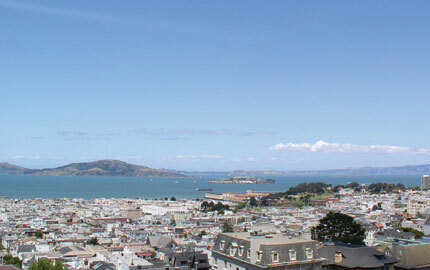 A walk to Fillmore Street restaurants and shopping provides the conveniences of city living at its best. Entry Staircase landing leads up to the spacious VIEW LIVING ROOM with wood burning fireplace and built-ins with unobstructed views of Alcatraz and the Bay through large picture windows. The DINING ROOM/FAMILY ROOM faces southern vistas of Alta Plaza Park and easy access to a lovely large terrace, the gathering point for entertaining and alfresco dining. A fully equipped country KITCHEN is open to informal dining in the cheerful south facing BREAKFAST AREA. 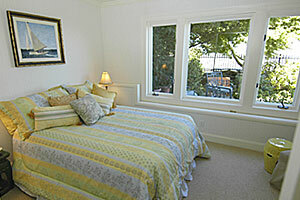 The tranquil VIEW MASTER BEDROOM enjoys vistas of Alcatraz, Golden Gate Bridge and the Bay. A spacious walk-in DRESSING CLOSET has ample space for his and her wardrobes. 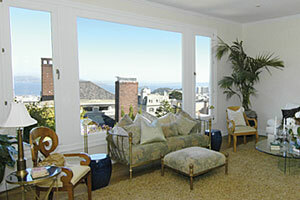 Delightful and private MASTER BATH looks out to the Bay and Alcatraz view. Large Jacuzzi tub/shower & double vanities. 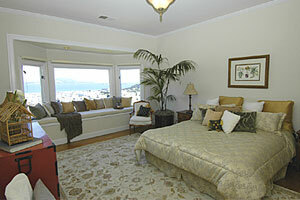 Spacious second & third BEDROOMS are both south facing with Alta Plaza Park views. Shared full BATH completes this light filled level. From the entry hall easy access to the private Fourth BEDROOM overlooking the north facing lush garden includes a full BATH, ideal for an older child, au pair or guest suite. 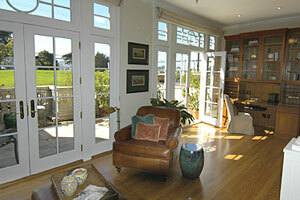 A FAMILY/PLAY ROOM with direct access to the private PATIO & TERRACED GARDEN adjoins. Large two car tandem GARAGE with interior access, utility room, additional storage space and cabinets. The wrap-around entertaining roof deck has partially enclosed windows for full enjoyment of the VIEWS OF THE SAN FRANCISCO BAY!